The typical breeder of sport horses in this country seldom gives the Morgan Horse a second thought. Unless you are familiar with the breed and its different branches, most assume it is only a driving or park type mover (elevated action) from publicizing of the highly visible show ring specimens. However, those show ring strutters are not the normal Morgan, nor are they the traditional Morgan. And in not understanding the true genetic gifts the Morgan Horse has for the sport breeder, we are losing out tremendously--the Morgan Horse is truly an American treasure for the sport horse breeder. The Morgan Horse is one of the oldest existing breeds of American light horse. As the 1800s were dawning several pockets of Running Horse derivative stock were becoming selectively bred for specific factors. The trotter in the northeast, the saddle horse in the mid-Atlantic area and the all purpose family horse--the Morgan in the northeast. The Morgan is an unusual breed because it springs from one foundation sire: Figure RH (sometimes called Justin Morgan), and contains repeated crossing in of his lines in an amount that is rarely seen in any other breed. 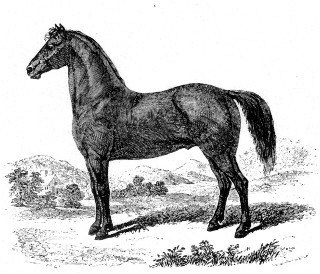 By the 1820s the Morgan was recognized in the northeast as a valued light horse, especially those strains that had crossed in more Running Horse. It instrumental in the development of the wildly successful Canadian Pacer base stock as well (see Standardbred Sport Horses for the history and bloodlines of both breeds). In 1840 enlightened breeders in western New Hampshire and southern Vermont made a concentrated effort to gather Figure RH's get together and form a registry of this breed based on strong inbreeding and linebreeding to Figure RH. This extreme typesetting resulted in a breed that after more than two-hundred years is still clearly recognizable as a Morgan. The above wood engraving of Figure RH is found in the front piece of Daniel Linsley's book Morgan Horses 1857. So to understand the Morgan we need first of all to decipher the genetics of Figure RH. In the era in which Figure RH was born, the improver of the day, that is, the horse breed used to upgrade the general light horse population, was our domestic racehorse: the American Running Horse--it had been selectively bred for stamina, speed, soundness and riding horse traits for one-hundred-fifty years by then. Because the roots of our Running Horse breed are in early Colonial times it has been assumed it was not a breed, but it was, and by Figure's day it was widespread. It was a superb racer at both the pace and the gallop for distance of 1/4 mile to 4-mile heat races, and it also was the perferred saddle and hunter horse. All this occurred a hundred years before the English Thoroughbred arrived in the Colonies (~1750). Naturally, the stallions and mares from this breed were desired as improvement stock. The owner of Figure RH, Justin Morgan, stood quality stallions in the western Connecticut and Massachusetts areas as well as in southern Vermont to supplement his earnings as a teacher. A study of Figure's pedigree reveals he was a fine example of the New England Running Horse. Figure RH is sired by a American-bred stallion of mostly English Thoroughbred blood, traditionally called True Briton or Beautiful Bay and he is out of an American Running Horse dam, the Diamond Mare. There has been almost a continual discussion and dissention about his parentage. Part of this is because of his extraordinary talents and pre-potency, part is because of the records of the day are from letters, stud ads, and some few publications, which is a spotty record that did not provide the full picture of the horse industry in the late 1700s, and try as they might, not all the researchers had access to all the records. Figure RH is an outstanding example of the New England Running Horse at the dawn of the 19th century and he set the type for a breed that is still a valuable resource for those of us who breed horses for sport. There are two versions here for you to consider--first is the pedigree put together by Daniel Linsley and Joseph Battell Figure (RH) pedigree (Battell version) and second is a newer version developed by the modern researcher Bruce Burton. Recently, after decades of research through the old records, archives, letters and stallion advertisements Burton determined that True Briton, Beautiful Bay and Hip were all the same horse, and from there he was able to put together the lineage you see in the link above (he is working a book that will document all his work). I am a great respecter of Joseph Battell, and his massive works: The Morgan Register and the American Stallion Studbook, which are historically significant volumes, highly accurate, and they preserve history we otherwise might have lost. But just like the immenient John Wallace, Battell, wasn't always one-hundred percent, and I believe in this case we must credit Mr. Burton for the fine work he has done. Personally, I can say that finally we have a pedigree that not only meets the historical record, but explains the genetic reach this incredible stallion had (you can read more about this in Standardbred Sport Horses). The eastern New York and western Connecticut areas were settled first by the Dutch who brought a cob breed with them--it was also small (14 hands) but was strictly a cob, a small sturdy harness/farm type, and it was not fast and it was not gaited. It was highly prized in the Colonies because of its usefulness in light farm and draught work. As roads were built and a faster harness horse was desired the Running Horse was often crossed into this cob breed. The Running Horse was the 'up-grader' of the day. Dutch Cob entered Figure's lineage via his dam. Later on (from 1730) the English Thoroughbred was imported into America especially into the racing hubs and crossed on our Running Horse for gains in height and distance speed. These are the three genetic components (Running Horse, Cob, early English Thoroughbred) that made up Figure's heritage. He did not have Arabian in him. You will see "Lindsay's Arabian" in his lineage as well as in the pedigrees of many other Colonial horses in both New England/New York and in the Virginia area where this horse stood. Lindsay's Arabian however in not an Arabian--he is a Barb/Running Horse, a typical English Running Horse of his time, with the Moroccan Barb in his lineage. 'Arabian' was added to his name once he was imported from Connecticut to Virginia, before that he was called Ranger. However, he was a Barb-Running Horse imported to Connecticut in 1766 and the shipping records and the importers notes have survived. Figure's dam however is an American Running Horse, which then makes Figure one also. Her sire Diamond RH is straight from the New York Running Horse breeding program. The big give away to that is he is inbred to Wildair. Wildair was an imported English Thoroughbred; imported by Lt. DeLancey in 1765 first for use by the Maryland Running Horse breeders and then later was brought north to DeLancey's own operation in New York; his family owned a famous racing stable in the Bowery section of NY. He was a racehorse sire and he was bred to the racehorse mares in both those areas. The racehorse mares were American Running Horses. Wildair was returned to England right before the Revolution. With Burton's revised pedigree we can see Figure RH is a Wildair typesetter, he is strongly inbred to him and passed on Wildair traits to the entire breed. So then Figure was a product of our New England/New York Running Horse operations and is then a snapshot of the quality light horse of New England in that day. He was tremendously pre-potent and had amazing ability--he was a champion sprint racer with tremendous stamina as well which he surely got from his Running Horse/Thoroughbred genetics, but he also was renowned for his draught strength as he was able to out-pull all others in his area, which reflects his cob heritage. So then Figure was a genetic Running Horse powerhouse- the little horse that could do it all. Now for sport horse breeders the bloodlines in the Morgan we will want to target are those that reinforce his sport heritage. We can see historically that when he was bred back to Running Horse dams he produced his most talented bloodlines. For example his best son lines, such as Woodbury Morgan who is out of a Running Horse dam and Sherman Morgan who is out of a Narragansett Pacer (New England Running Horse). These lines produced the best road horses being those that could travel at speed for long distances. But when bred to farm types--like the Canadian Horse or the Dutch cob he then got sturdy cob types who were more useful at log, draught and farm work- Bulrush Morgan is an example. In contrast fine saddle horse types were developed when the Running Horse genetics were reinforced. We see this in his son Copperbottom RH 1809 who was out of an Narrgansett Pacer dam (RH), this created a 3/4 RH genotype and Copperbottom RH--who was a fast pacing racer who ran 4-mile heats, went on to sire a dynasty of fine gaited saddle horses, and fast pacing lines found in the Standardbred. (You will see Copperbottom RH in the lineage of General Gates found in the connecting article). Above is the magnificent Black Hawk MO, from an engraving by Marston, and he was a super star in his day and still is today, as his bloodline is behind many top sport performers in multiples He is 3/4 Running Horse. You can see once again the 'Morgan' type in him, his dam brought in more Wildair. He sired a family of excellent trotting horses and his bloodlines are found in the background of our Standardbred, Saddlebred, Tennessee Walker, Quarter Horse and Missouri Fox Trotter as well as in the Morgan. His son Ethan Allen MO, besides being the fastest Trotter of his time, also built an enduring line, as well as his son in-turn: Daniel Lambert MO--bloodlines known for extreme athleticism, beauty, soundness and gentleness--what more could you want? This is your key to Morgan sport horse breeding: you must encourage the lighter sport lines, by reinforcing and building them up--but the result will be worth the effort. Which one of you wouldn't want to produce a Black Hawk type today? When our government went looking for the perfect cavalry horse at the turn of the century (1906) it was Black Hawk's descendants that proved they were the right stuff. 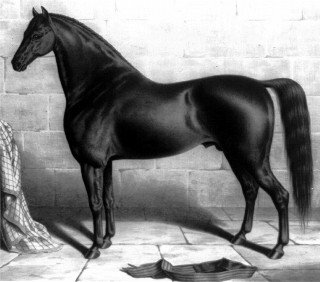 The Morgan 'warmblood'--before any European stud book began breeding and testing for the sport horse, our own government conducted a breeding program that refined the bloodlines of the Morgan in the highest level of saddle and cavalry horse performance, with testing and culling for just the traits we are longing for. This government project should be of interest to every domestic sport horse breeder. It held its breeding stock to a level of excellence few breeding programs have equaled before or after. They culled extensively, basing their choice of stock on a extreme performance standard. The horses all had to prove successfully at basic saddle work (what we call dressage today), but they also were tested in jumping, and a cross-country test and they had to complete a three-hundred mile endurance ride! Those lines that could not hold up were removed. The result was horses of immense stamina, toughness and versatility. This program stayed in place until 1950. Many of those Morgan stallions were used in the cavalry remount program. All of those bloodlines are readily available for you today. The cavalry program favored Thoroughbred stallions (93%) but a significant number of the performance tested Morgans were welcomed also (35), as well as hundreds of Morgan, American Saddle Horse and Standardbred mares. The Remount bred stock later had a huge positive impact in the upgrading of the western horse industry. Of interest also is that another successful breeding program was set up using the Morgan. This was at the Livestock Experimental Station in Montana where they had great success with Thoroughbred-Morgan crosses, producing large well conformed athletic mounts. For us--the sport horse breeders, to ignore this resource found in the government program descendants would be silly. They are bloodlines that are concentrated and proven in what we need and they are right here in our modest Morgan horse of today--waiting for you to ignite the genetics all over again. Pure-bred Morgans are winning today in all disciplines. They can also be extremely useful to those sport horse breeders who have largely Thoroughbred bloodlines as a typesetter. They can bring gains in temperament, style, soundness, beauty and versatility. Our sport cavalry horse of the 1930s had reached such a level of excellence that it won multiple medals in all three Olympic disciplines; gold, silver and bronze in Jumping, Dressage and Eventing. The sport horses our cavalry were riding were 1/2 to 3/4 Thoroughbred--the other portion was Morgan, Standardbred and American Saddle Horse. History has shown this is a winning combination. Amateur sport participants will delight in the Morgan also because it never lost its sweet temperament, it actually likes people, and the modern Morgan is usually between 15 to 15.3 hands tall, sturdy also and able to carry weight with ease. Crossing with Thoroughbred will easily produce sport horses 16 to 16.2 hands--perfect. Of interest to some is that approximately ten percent of the Morgan breed is gaited, displaying a amble or running walk naturally. Considering the vast amount of Narragansett Pacer that entered the gene pool early on I am surprised this shows up in only 10%. But the carriage Morgan breeders wanted a trot, not a pace, and so the gaited strains died out in many of the lines. I am told by long time Morgan breeders that many more of the Morgans had an amble just thirty years ago. This was so in the Quarter Horse breed as well, but now it is hard to find a natural ambler in them either. Even gaitedness in the Saddlebred is dying out. Luckily the Tennessee Walker is still strong in gaits, as is the Standardbred. I would hate to think that modern fashion would hasten the demise of our national heritage in fine gaited saddle horses. The Irish Hobby was gaited, and it is the base of all our sport breeds. A note on the show ring performer: as in other of our domestic breeds there have been some strains developed for the 'show ring" that have produced a type that is not faithful to the original Morgan. The founding sire Figure RH did not 'high step' like a Hackney, nor did his most successful bloodlines such as Sherman Morgan (out of a Narragansett Pacer dam) or Woodbury Morgan (out of a Running Horse dam). So where does this 'Hackney" like movement in some strains come from? Most probably it began sometime after Dr. Webb brought in Hackney stallions to his stud in Vermont and proceeded to market them aggressively. Then in 1948 strong selection processes, severe training methods and the bringing in of other breeds allowed the show ring specialists to change some strains of the Morgan type into a high-strung horse with elevated gaits for the park disciplines. Unfortunately this movement also brought in conformation faults--such as poor legs and feet and swayback showing up in this specialized type. Generally, this type of Morgan will not help your success in Olympic style sport; your true sport gold will be found in the old style Morgan. Fortunately for us the show ring strutter is only a minority of the breed, the rest, faithfully preserve the original Morgan type--a horse so exceptional that it has existed unchanged for hundreds of years.